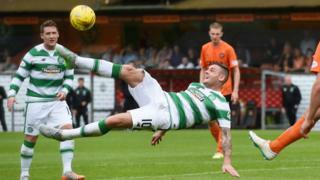 Dhearbh manaidsear Chaley Thistle, Iain Hughes, nach gluais Anthony Stokes a dh'Inbhir Nis. Bha Hughes air innse roimhe gun robh e 'son Stokes a thoirt à Celtic air iasad. Shoirbhich le Stokes fo stiùir Hughes roimhe aig an Eaglais Bhric is aig Hibs. Chan obraich iad còmhla aig Caley Thistle, ge-tà. "Tha sinn a' guidhe gach soirbheachas dha", thuirt Hughes. "Feumaidh sinn gluasad air adhart ach ag innse na fìrinn, bha sinn a' dèanamh sin bho chionn 3 no 4 làithean. "Thuig sinn, a' coimhead air a' chùis, nach robh e 'son tighinn gu Inbhir Nis. "S e caraid dhomh a th' ann fhathast. "Feumaidh gu bheil e gu math fut. Fhuair mi teachdaireachd bhuaithe bho chionn ceithir làithean ag ràdh gum fònadh e às dèidh trèanadh. "Feumaidh gun robh e a' trèanadh 'son nan ceithir làithean mu dheireadh", thuirt e.
Ràinig Dundee United aonta le Celtic a thaobh Stokes a ghabhail air iasad. Thuirt am manaidsear, Mix Paatelainen, ge-tà, nach iad United as coltaiche Stokes fhaighinn. Thathas a' tuigsinn gu bheil còmhraidhean a' leantainn eadar Stokes is Hibs.